If you’re interested in keeping up with the revolution taking place in our mass media, you need to read this. The Pew Research Center’s Project for Excellence in Journalism has released its annual report, The State of the News Media in 2010, and it’s the most authoritative and detailed snapshot of the changes rapidly taking place around us. 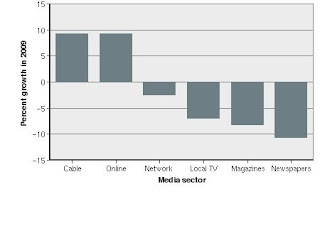 - Audiences continue to drop dramatically for the traditional media (see chart), especially for magazines and newspapers. - The only “old media sector” with an expanding audience is cable TV – up nearly 10%, and fueled largely by commentators expressing views, not news. Fox News audiences grew by nearly 25%. - Analyzing over a million blogs and social media sites, PEJ found that 80% of their links to information sources go to the traditional media. That’s where nearly all the original reporting still takes place. The digital media largely grab what they like and give their “take” on it. They don’t have the manpower or budgets to do original reporting. - The newspaper industry has lost about 30% of its basic reporting and editing capacity – some $1.6 billion worth – since 2000. The cuts will continue. - Network news staffs have been cut by more than half, compared to the 1980s, and the major newsmagazines by nearly half. - Two-thirds of the most popular on-line news sites are the digital arms of traditional media – newspapers, magazines and broadcast stations. Another 13% are “aggregators,” simply compiling information they collect, largely from the mainstream media. Only 14% are truly on-line news operations that do original reporting. The report is full of information that can be helpful to anyone trying to communicate in today’s fast-moving media environment. The rise of digital is providing countless new targets of opportunity for getting information out to the public. But the original source of most information that goes out widely is still the old stand-bys, print, radio and TV. Are the Caps Losing the PR Battle over Ove?